Pancit Bihon Guisado with rice noodles, meat, shrimp, and vegetables is sure to be a family favorite. Perfect for everyday meals and special occasions! 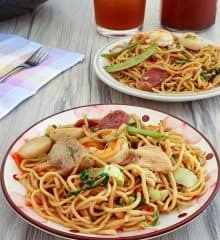 Pancit bihon guisado is a Filipino noodle stir-fry popular for everyday meals as well as for special occasions. The dish is often served on birthdays as the long noodle strands signify long life in Asian culture. A delicious hodge-podge of rice noodles, meat, shrimp, and vegetables, it’s a one-pot meal that’s a guaranteed crowd pleaser! There are so many ways to make this dish, every cook or household is sure to have their own delicious spin. Sweet sausage hamonado, chicken, shrimp, carrots, cabbage, and celery are the standard ingredients in my version of pancit but feel free to swap or add your own favorite mix-ins such as pork, liver, sweet peas, and mushrooms. While most recipes suggest soaking the rice noodles in warm water to soften before cooking, I like to parboil the noodles in broth instead. This simple trick of submerging and BRIEFLY cooking the noodles in stock adds more depth of flavor. Please note that this is a very quick step and is only to loosen and slightly soften the strands as the noodles will finish cooking during the stir-fry process. The secret of a successful stir-fry is how the ingredients are prepped and sliced. Cut your meat and veggies into uniform bite sizes so they’ll cook fast and evenly. Another important component of a successful stir-fry is the cookware you use. A wok, of course, is the best for the job but any wide skillet with slanted sides will work as well. You might have to cook in batches if you don’t have a big enough cookware to prevent spills (tossing all the ingredients can get pretty messy) and to ensure good distribution of ingredients. Use tongs to stir-fry to help keep the noodles intact and lessen breakage. Nothing ruins a good platter of pancit bihon in my opinion than mushy noodles and limp vegetables! Slightly undercook the vegetables during the initial stir-fry as they will continue to cook when the noodles are finished off. Make sure to stir-fry on high heat so everything sears nicely and won’t overcook in the steam. I like the sweet and salty flavors pork hamonado adds to the pancit and I prefer it over regular pork. If you can’t find it, you can substitute Chinese sausage called Lap Xuong Thuong Hang. Pancit Bihon Guisado with rice noodles, meat, shrimp, and vegetables is sure to be a family favorite. Perfect for everyday meals and special occasions. In a large pot over medium heat, combine chicken stock and soy sauce. Bring to a boil. Submerge noodles into the liquid and cook, using tongs to loosen strands, for about 1 to 2 minutes or just until softened. Drain noodles and reserve about 1 1/2 to 2 cups of the liquid. In a wok or wide skillet over medium heat, heat about 1 tablespoon oil. Add shrimps and cook for about 1 to 2 minutes or until color changes to pink. Remove from heat and drain on paper towels. Add pork hamonado and cook, stirring regularly, until they start to brown. Wipe down wok or skillet as needed and heat another tablespoon of oil. Add onions and garlic and cook until softened. Add chicken and cook, stirring regularly, for about 3 to 5 minutes or until lightly browned. Add carrots and celery and cook for about 30 to 40 seconds. Add cabbage and cook for about 30 to 40 seconds. Continue to cook until vegetables are tender yet crisp. Return shrimps and hamonado to the wok. Add noodles and reserved liquid in 1/2 cup increments. 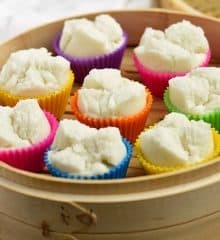 Gently toss and stir, adding more liquid as needed, until noodles are cooked yet firm to bite, vegetables are tender-crisp, and liquid is absorbed. Season with salt and pepper to taste. Transfer to serving platter and garnish with chopped green onions. Serve with calamansi wedges. May I ask, if putting in the pork hamonado do I prepare it like the recipe link you shared and then add it to the pancit? Pineapple and all? Just not sure how to prepare the pork and add it to the pancit. Thank you for your help. If I don’t have access to hamonado or the Chinese sausage, what else can I substitute? I am just wondering if it’s a typo error. For an 8 oz noodles, there is 16 oz of hamonado added??? How is that possible? It’s because ounces is for weight and not the volume. Since pancit bihon is lighter in weight, you get more bulk for 8 ounces and the noodles will expand as well when cooked. Thanks for the tip about parboiling the noodles first. My pancit used to be mushy because I boil the noodles at the end of the cooking and wait for the liquid to evaporate, but with your technique, it stays firm. This looks delicious. Although my friends and family love my bihon guisado but I may find yours is better and tastier because there is hamonado. What if I don’t have hamonado what’s the subsitute. What kind of bihon noodles you’re using. You can sub Chinese sausage called lap chong if you can’t find hamonado. I usually buy whatever bihon noodles are on sale, I just adjust cook times and liquid accordingly as some brands are sturdier than others. Can I make it vegan and get the same flavors. Probably not the same as the meat and seafood do add tons of flavor but it can still be delicious. Try adding fried tofu cubes and vegetable broth. I was introduced to pancit in the early 70’s by filapinas in a club at my University. They always told not to overcook the veggies and to use meat as a flavoring and condiment to the dish. I agree with you that the cuisine is under represented. My korean inlaws are asking me to cook filipino food for them.. I’m gonna try this. It looks delish! You are perfectly right! Pre cooking the noodles for a few minutes in the stock made a lot of difference than the regular soaking in cold water. The noodles tasted better. Excellent tip Ms. Lalaine. Thanks! I totally agree with you “What’s not to love about your wonderful Filipino food. I found two restaurants in Las Vegas that I just wanted to pick up and move to my hometown. They were busy and their food was excellent! With your expertise, you would do well managing the food prep in a successful “Filipino Restaurant”. We tried this recipe yesterday and the result was “DELICIOUS”. My husband loves it and we definitely add this recipe to our fav list. Thank you for sharing this recipe! I like the recipe that you make but it’s very hard to navigate your website. you need to add the search box . Good luck and thank you.